Monster, a trusted name when it comes to high end audio equipment, has just rolled out its Turbine Pro In-Ear Speakers that were specially made to offer the kind of reference-quality sound which will definitely find favor with music professionals and discerning audiophile listeners of today. Head Monster Noel Lee personally designed the new Turbine Pro headphones, making sure the master’s touch can be seen in each and every Turbine Pro, where the headphones will rely on a lethal combination of advanced design, engineering and technologies in order to offer a new level of portable audio performance which are geared toward serious audiophiles and audio professionals. This pair is more or less the pinnacle of Monster’s approach where headphone design is concerned, resulting in an advanced personal listening solution which is more than capable of offering a similar sonic impact, power and performance as with reference quality high-end loudspeakers. Guess the recent Beatles re-release of remastered tracks in digital format will benefit from a pair of Monster Turbine Pros. Each purchase of the Turbine Pro will be accompanied by new high performance “SuperTip” eartips that are touted to offer superior noise isolation whenever they’re put on, helping increase the overall performance by preventing sound leakage. According to Monster’s research on these eartips, results point toward a significant improvement in headphone performance when put on, and will come in small and large sizes. For those who have grown attached to traditional Monster eartips, fret not – three sizes of those were also thrown into the equation apart from foam tips and two sets of triple-layered eartips for a perfect fit, regardless of whether you have Dumbo ears or not. 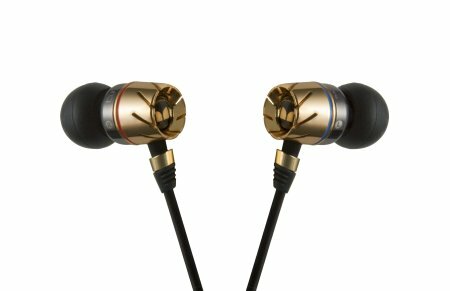 The new Monster Turbine Pro headphones will be released to the market sometime this November, where you can choose from a couple of designs – gold with black chrome, and copper with bright chrome. Each purchase will feature an attractive, super soft sewn pouch and a matching clip pouch, where it will retail for $299.95 per pair or $329.95 with Monster’s ControlTalk headphone cable. I amazed you can say that with a straight face.